In this Jan. 29, 2018, file photo, foam images of the MLB baseball Cleveland Indians' mascot Chief Wahoo are displayed for sale at the Indians' team shop in Cleveland. 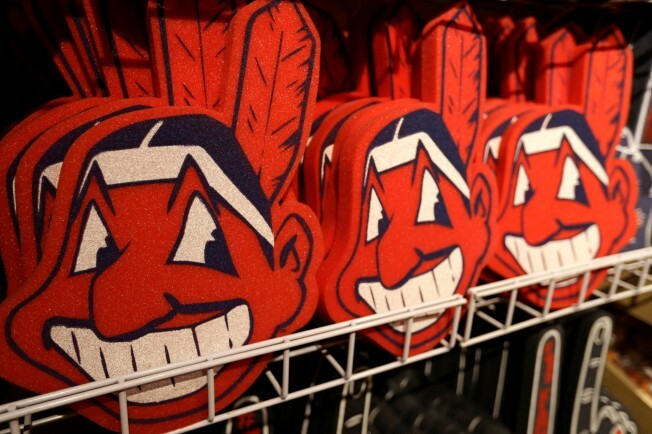 The Chief Wahoo logo is being removed from the Cleveland Indians' uniform in the 2019 season, but the Club will still sell merchandise featuring the mascot in Northeast Ohio. The U.S. has spent most of 2019 coming to grips with blackface and racist imagery, but Native Americans say they don't see significant pressure applied to those who perpetuate Native American stereotypes. John Little can hardly go a week without a reminder that he and other Native Americans often are viewed as relics of the past: the Indian maiden on the butter container at the grocery store, the kids' teepees sold at popular retailers and the sports fans with their faces painted doing tomahawk chops at games. But he doesn't hear widespread outrage over these images that many Native Americans find offensive, even as the country has spent most of the year coming to grips with blackface and racist imagery following the revelation of a racist photo on the Virginia governor's college yearbook page. Since then, new examples have surfaced regularly, most recently a TV host who painted her face brown in a parody of Oscar-nominated Mexican actress Yalitza Aparicio. "These are everyday realities for Native people," said Little, a Standing Rock Sioux tribal member. Redface may get less attention because of ingrained misconceptions and feelings of entitlement to Native American culture and land, scholars say. Native Americans also are a relatively small group, making up less than 2 percent of the U.S. population. Blacks, by comparison, make up around 13 percent. Convincing the masses that stereotyping Native Americans as savage, ignorant or humorless is insulting has been a slow movement, scholars say, and one they aren't sure will gain steam. Throughout America's history, people have donned redface, worn fringe and feathers, and spoken in broken English as they "played" or portrayed Native Americans in theater, film and everyday life. In one of the earliest examples, colonists dressed as Mohawk Indians dumped tea into the Boston harbor in 1773 in protest of British rule. Early settlers wanted to take what they saw as the best values of Native Americans while simultaneously seizing the land and destroying tribal communities, scholars say. Part of that was a desire to be seen as indigenous to the new land. Secret societies based on Native American symbols, customs and terminology formed and still exist, such as the Improved Order of Red Men and the Boy Scouts' Order of the Arrow. Waves of Jewish immigrants in the early 1900s sought to align themselves with Native Americans, whom they saw as fellow displaced people, dressing up as and singing songs about being Native American while belittling them to be socially accepted, said Peter Antelyes, an associate professor in English and Jewish studies at Vassar College. Philip J. Deloria, a Harvard University history professor and author of "Playing Indian," said Native Americans also were hypersexualized and depicted as cannibals. One famous political cartoon shows European nations lifting up the skirt of a Native American woman to reveal the newfound land, suggesting both were open to the desires of men, he said. The Last of the Mohicans, published in 1826, furthered those depictions and stereotypes, as did Buffalo Bill's Wild West shows, Deloria said. Some actors later playing Native Americans made it their real-life image. Italian-American actor Iron Eyes Cody is well-known in Indian Country for a 1971 environmental ad in which he shed a single tear after paddling through a river littered with trash. He wore fringed buckskin and had a feather in his long, braided hair. Most people think those images, largely based on 19th century Plains Indians, are who Native Americans were and still are, Deloria said. And some believe Natives went extinct. "There's a big, long, complicated history to this that's really deep in American culture," Deloria said. "It's every bit as deep as blackface minstrelsy and slavery. It's just out there, but we've kind of forgotten about it." Nowhere is redface more prominent than at sporting events featuring teams with Native American mascots like the Redskins, Braves and Indians, and around Halloween. In the documentary "More Than a Word" about the Washington Redskins, fans say the team name honors Native Americans. Stadiums today are dotted with fans who paint their faces, perform their versions of a Native American dance or war cry, and wear toy or replica headdresses that are mass-produced. It's insulting to many Native Americans because headdresses historically were a symbol of honor and respect, earned by tribal chiefs and warriors, they say. Modern-day veterans and leaders sometimes are gifted them in ceremonies and honored with the right to wear them. "It's easy to do the comparison: If this was blackface, it wouldn't be tolerable," said Little, who co-directed the documentary. "But that also discredits it because you are comparing issues in two separate races and two distinct people." Redface for many Native Americans isn't limited to face paint. It also includes clothing and speech. Celebrities have donned fake headdresses and feathers and hosted cowboys and Indians parties without many repercussions, beyond being called on to apologize. Non-Native actors portray Native Americans in movies more often than Native Americans do. And some politicians routinely cast doubt on tribes' ability to control their own land. "It's hard for me to say people don't know it's wrong," said Kyle Mays, an assistant professor of African American and American Indian studies at the University of California-Los Angeles, who is black and Saginaw Anishinaabe. "They might not know Native people, (but) they know it's wrong and it's just OK to do because there are not any consequences for it." Nicholet Deschine Parkhurst, who is Lakota and Navajo, has been trying to take companies to task for misappropriating Native American culture and to highlight indigenous people in a more contemporary way. "When you're viewed in that way, as only existing in the past, as the 'frozen Indian' found in museums ... it makes it harder for voices of leaders in our communities to actually be heard, and it's easier for people to ignore us," she said.